Birkwin Jersey released a new video today for "Angular Danson" featuring some mesmerizing visuals. Check it out below, and if you've been waiting to pick up a copy of "Between The Weather And The Sea", there's no better time than the present! Check out the Shop to pick up one of the last remaining copies. 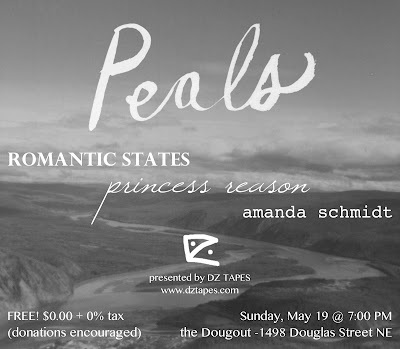 DZ TAPES is hosting its next atmospheric audio showcase on May 19. If you're in the Washington DC area, feel free to stop on by for a low-key Sunday night slow-burner featuring some up-and-coming organic electronica from Baltimore and one act from College Park's cassette champions at Tricot Records. Click the flyer below for more information at the event page. ∞∞ ROMANTIC STATES play weird, skeletal folk pop, and are coming back to the Dougout to share some mellow cuts from the “Vessels of Devils” LP, self-released this past March. ∞∞∞ PRINCESS REASON is an intimate lo-fi indie pop project from College Park and will be playing humble new tracks including ones from the “Always Pretty” EP featured on Tricot Records. ∞∞∞∞ AMANDA SCHMIDT plays a peaceful mix of keys and pedals, but her enigmatic recordings remain buried on the moon's deepest crater.